It could have been a very sad occasion - instead it was a true celebration. It may have been the giant balloons, of course. Bright blue they were, a figure 2 and a figure 5, representing the 25 years that Voluntary Action Worthing spent supporting local Voluntary organisations to grow and thrive. I do think a balloon or two adds a great deal to any event, whether it be a birthday, an anniversary or - in this case - a Farewell Forum. I was proud and privileged to be the Chair of Voluntary Action Worthing for five years, from 2013 until 2018. I was sad, indeed, when I had to step down almost a year ago, on account of the demands of being a full-time carer for Mr B. Knowing that time was running out for the organisation, as our funds dwindled, made it even more distressing. Karl Allison, from the Worthing Community Chest, summed up the spirit of our town’s Voluntary organisations perfectly and left everyone with a feeling of confidence for the future. Peter, our current Joint Chair, introduced the Legacy Report we have produced, containing many touching testimonials from organisations we have helped in the past. Emma, from Brighton & Hove Community Works, explained how she will be taking our work forward in the future, reassuring the audience with her obvious love for our town. So many people stood up to thank Voluntary Action Worthing and to tell their own stories of the help we have given them. 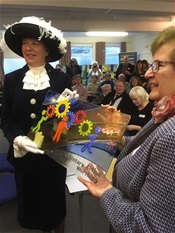 Finally, the High Sheriff of West Sussex, Caroline Nicholls (no less) joined Hazel Thorpe, the Deputy Mayor of Worthing in unveiling a commemorative stained glass window which will be installed on Worthing Pier next month. “I’m over-dressed as usual!” Caroline quipped when I greeted her - but “Never!” I stoutly assured her. I love the superbly historic uniform of the High Sheriff, with its flamboyantly feathered headgear, which means that Caroline’s presence has been seen, felt - and warmly appreciated - by every one of the many organisations she has visited over her year of office. As the afternoon drew to a close, many hands helped transfer a feast of sandwiches, wraps, cakes and fruit from the kitchen to the hall. Peter had confided to me a few days ago that he would be picking up the sarnies from a local supermarket on the morning of the Forum. It reminded me of The Donald, ordering Big Macs and Happy Meals for a recent gathering of footballers at The White House. When describing Worthing to outsiders, it isn’t the seaside, or the parks and gardens, the town centre or the historic buildings that spring first of all to mind - it’s the community spirit, the people, the projects combining to make our town a special place to live and work. I am so proud that we at Voluntary Action Worthing, not forgetting the amazing staff who have worked for us, have been a major part of that and I hope our legacy will live on. I think you will agree that’s quite a legacy.